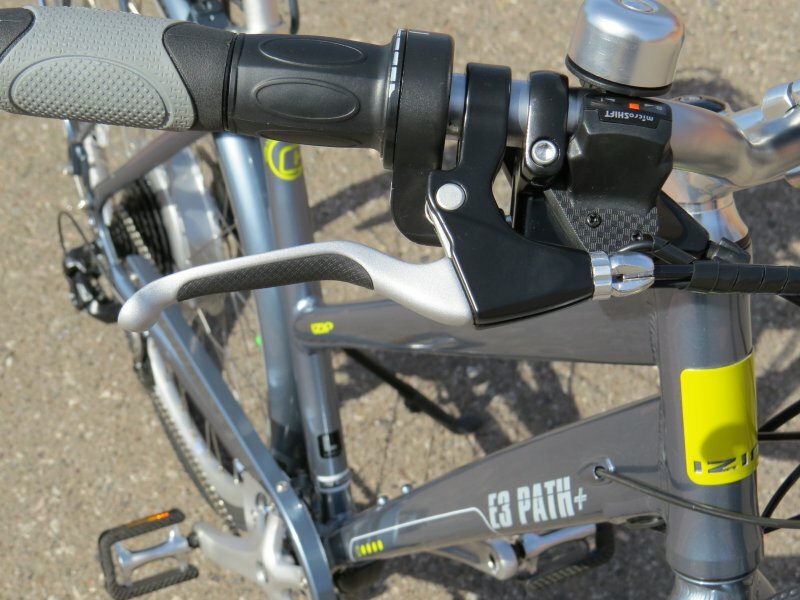 In this first part of the review there are a BUNCH of detailed pictures and specifications to get you familiar with the 2014 Path+. This is a review of the Path+ low step model. 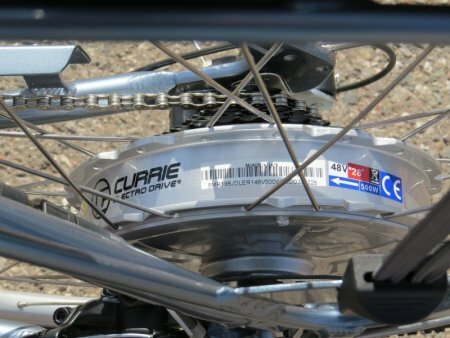 Currie Tech also makes a triangle frame of the Path+. 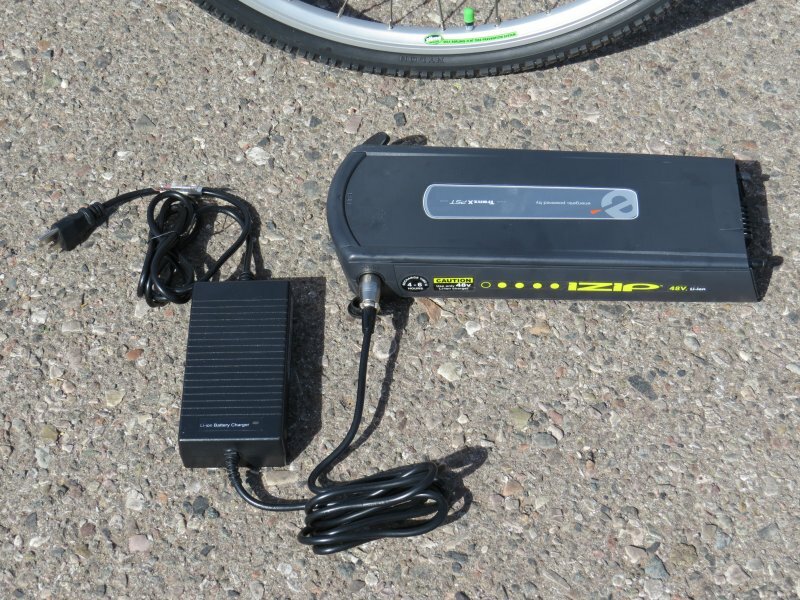 The IZIP E3 Path+ is priced at $2,200 USD at the time of this review. 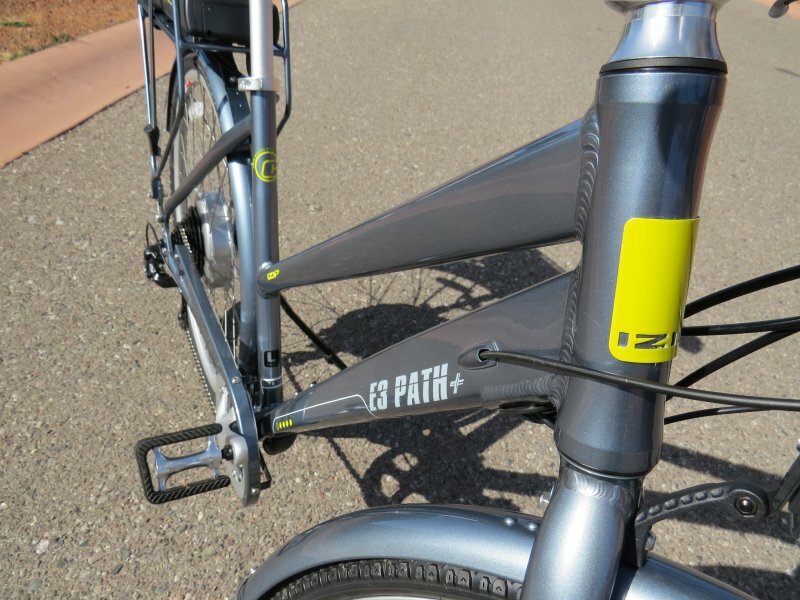 Part 2 of the IZIP E3 Path+ review will give you info on ride characteristics, results from the range test, pros, cons, and overall thoughts on this e-bike. 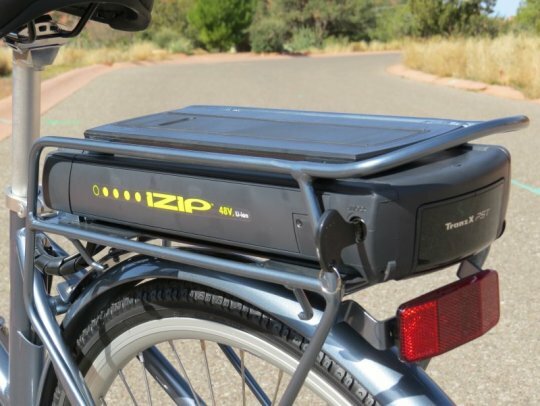 Alright, let’s get into the details of the IZIP E3 Path+ electric bike! The new 2014 IZIP E3 Path+ maintains the commuter style with an upgraded electric system! The cockpit of the Path+. The large LCD display is mounted front and center. 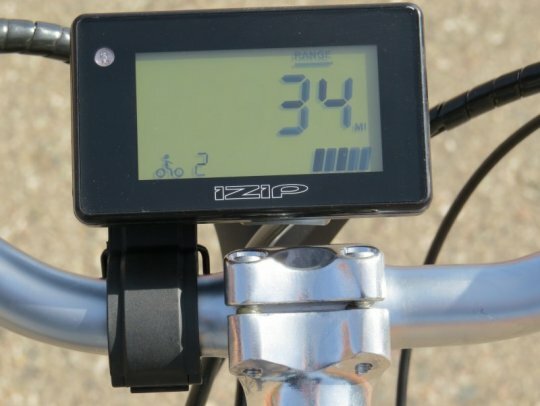 The new IZIP E3 Path+ LCD display is impressive. It is very easy to read day or night with a backlight feature. In addition, the range feature estimates how many miles you have left based on which assist mode you are in! There is also information on your battery level, speed, odometer, distance, assist level and cruise control. 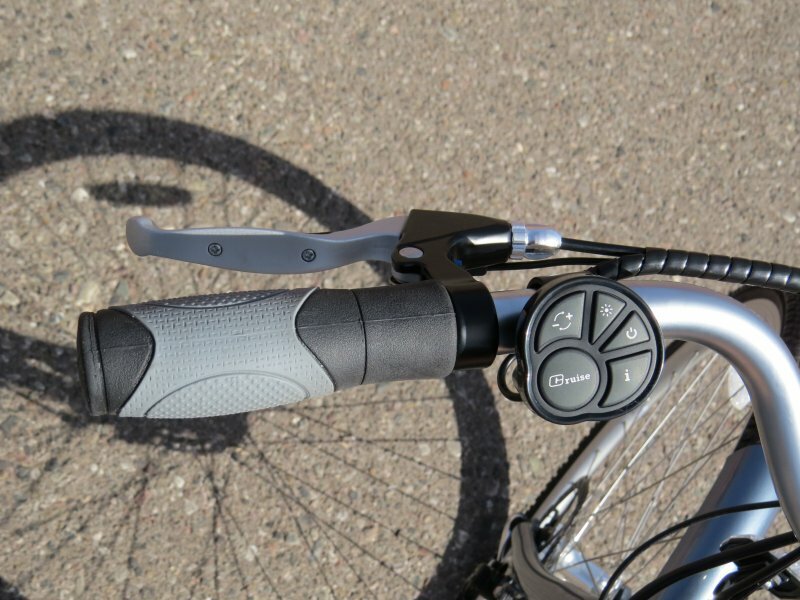 The front brake lever and control pad are on the left side of the handlebar. 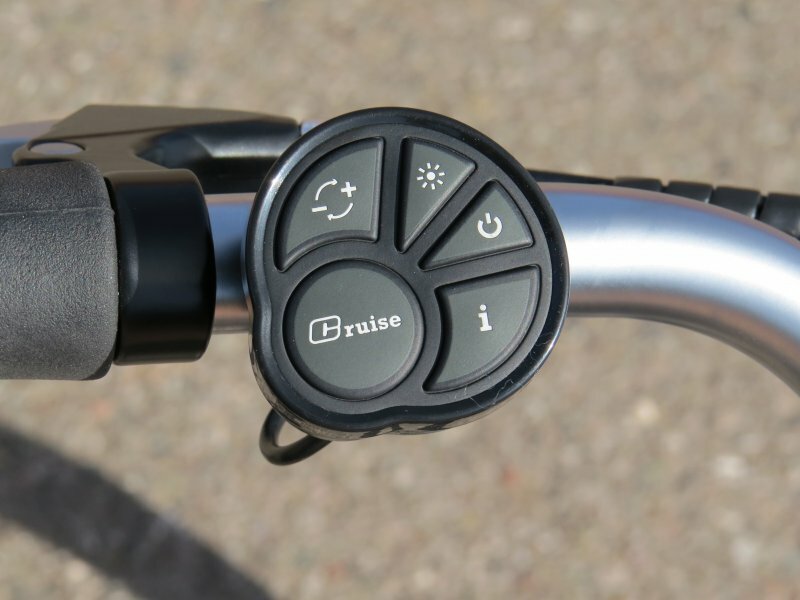 The control pad is where you adjust the Path+ settings. 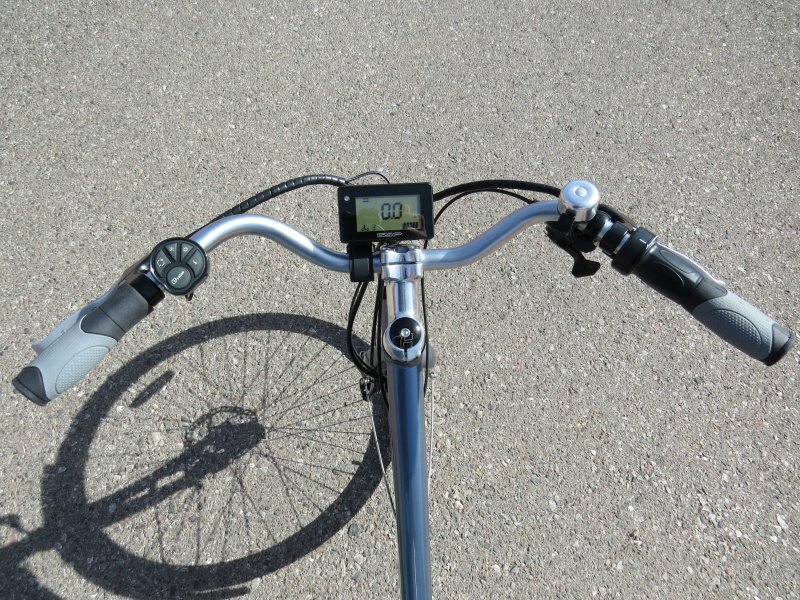 Turn the bike on/off, cycle through the display info, set the cruise control when using the throttle, turn lights on/off (there are wires that allow you to connect any 6V light set) and adjust the pedal assist levels (0 thru 4 or throttle only). 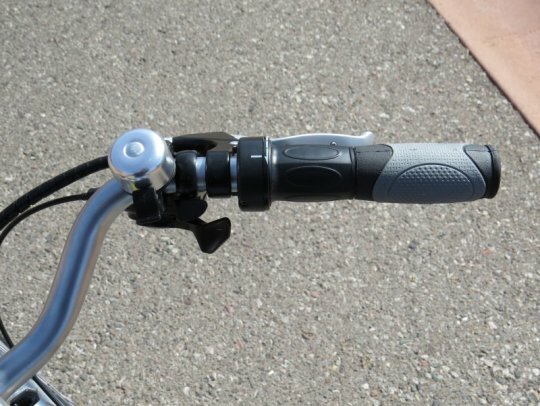 On the right side of the handlebars you will find the rear brake lever, the twist grip throttle, the 8 speed shifter, and a bell. Here is a closer look at the rear brake lever. Both brake levers have a grippy surface and they have electrical switches that will stop the assist when the brake levers are engaged. 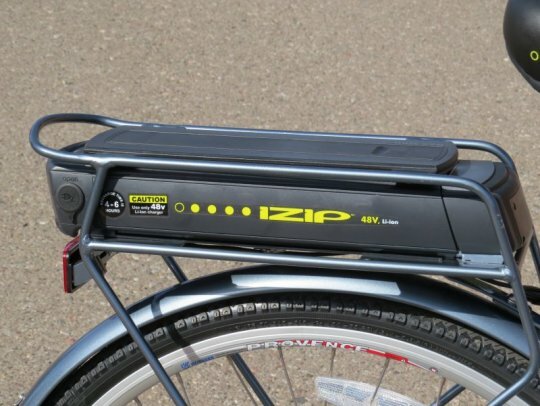 The IZIP Path+ features an aluminum frame to keep the weight down. 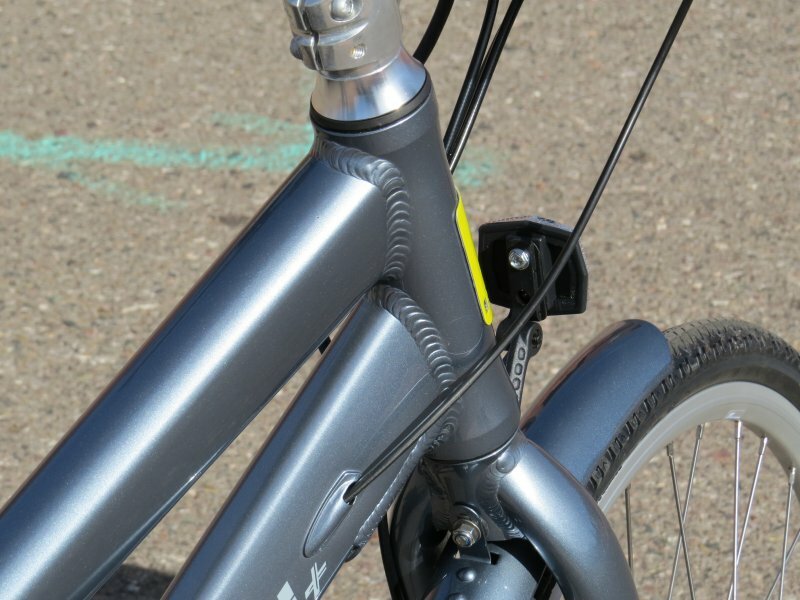 Here is a close up of the headtube to give you an idea of the weld quality and frame detail. The Path+ keeps things clean with internal frame cable routing. Here is another example of the internal frame cable routing. 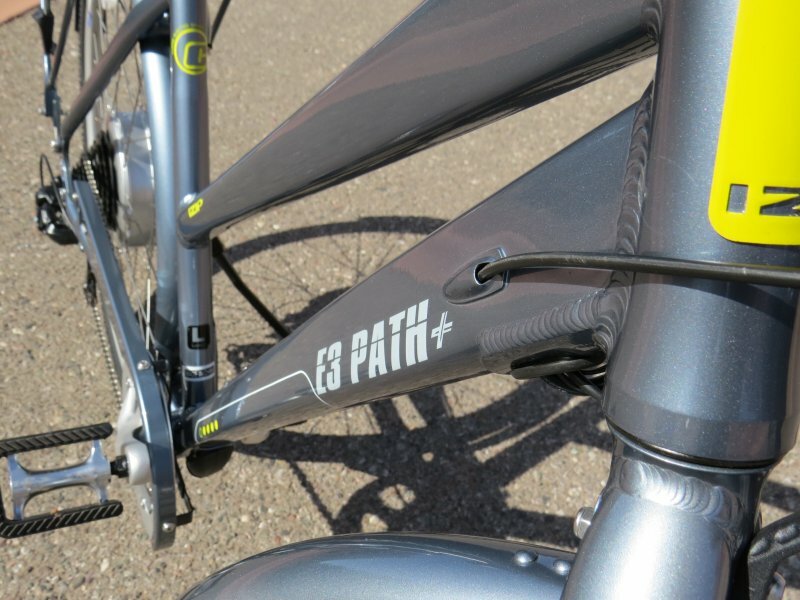 The Path+ comes equipped with an aluminum fork and metal fenders front and rear. 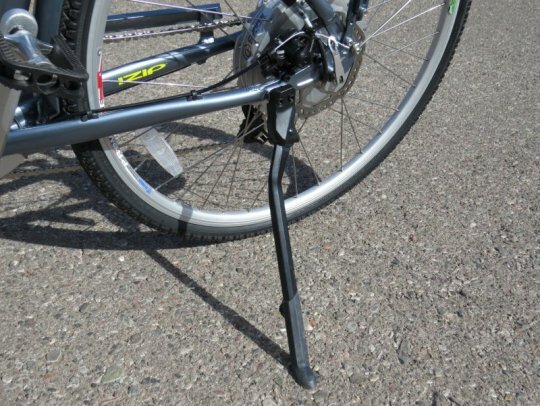 A metal chainguard keeps your pants legs clean. 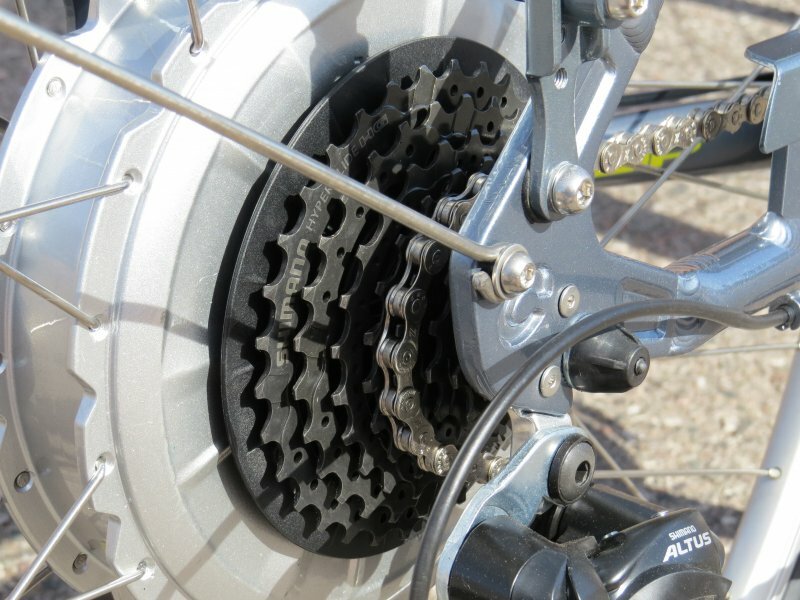 In addition to the chain guard, there are 2 chainring guards to prevent the chain from coming off of the chainring. 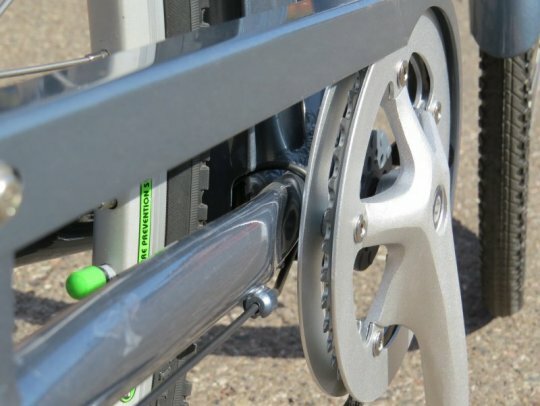 There is a cable protector along the frame near the cranks. 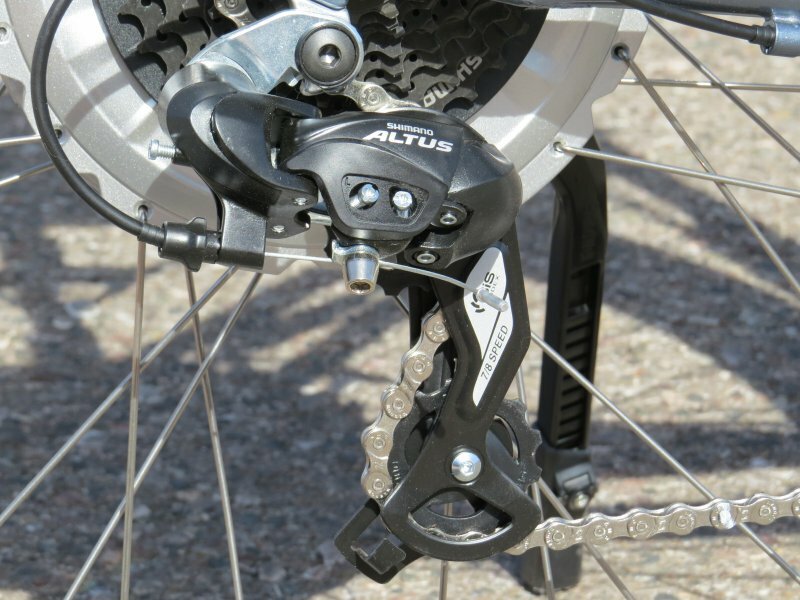 A Shimano Altus derailleur shifts through the 8 gears on the Path+. 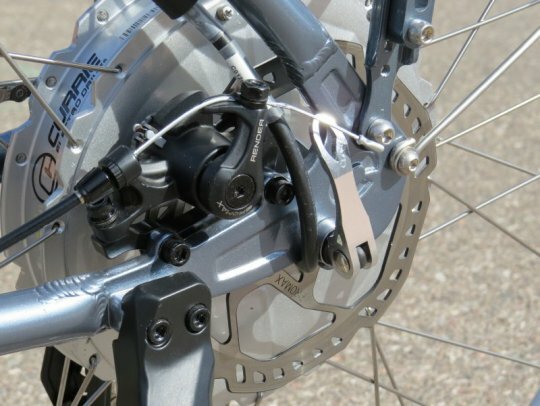 This is the Shimano cogset with a range from 11T to 34T; a nice range for everyday e-bike riding. 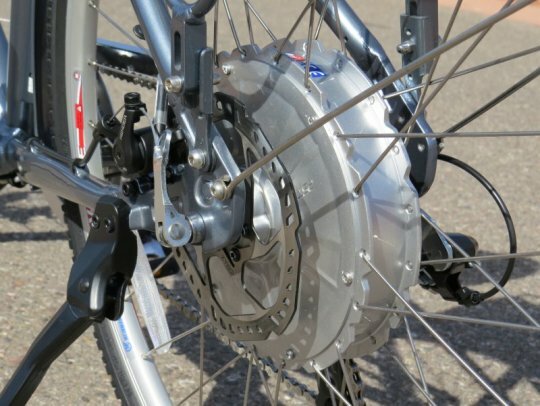 And this is a cassette, not a freewheel. The motor has a freehub, which is a nice upgrade when compared to a freewheel. 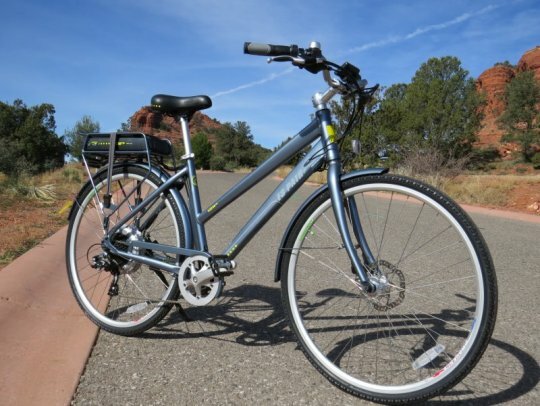 A quiet 500 watt direct drive motor powers the Path+ up to 20 mph and provides 42 Nm of peak torque. 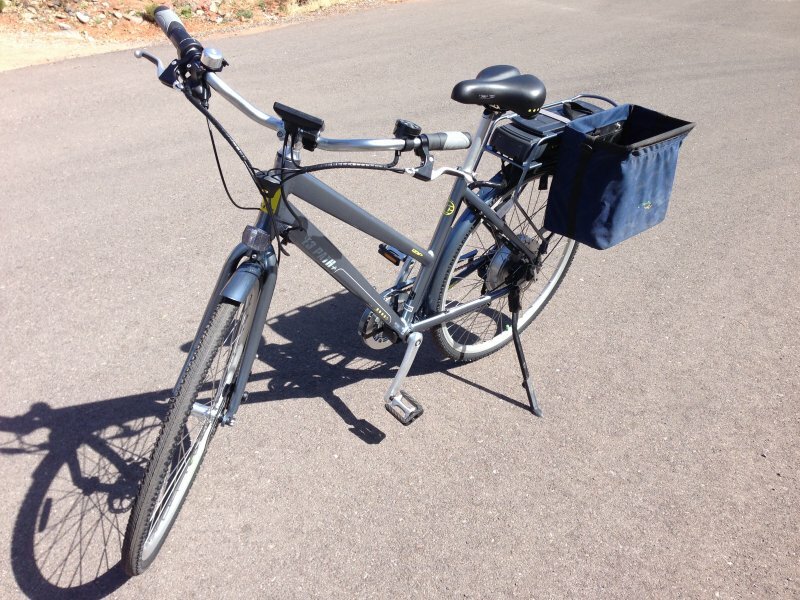 Here is another view of the 500 watt motor. A quick disconnect cable is provided to make removing the rear wheel easy. Promax Render mechanical disc brakes with 160mm rotors provide ample stopping power. 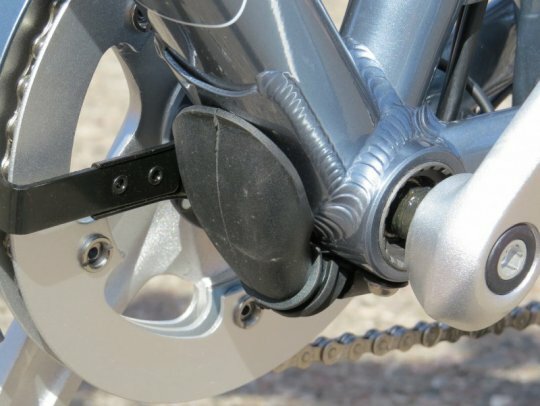 Also, note the quick release; that is a nice upgrade compared to most motor hubs that bolt on. The kickstand on the Path+ is mounted directly to the chain stay tube of the frame. 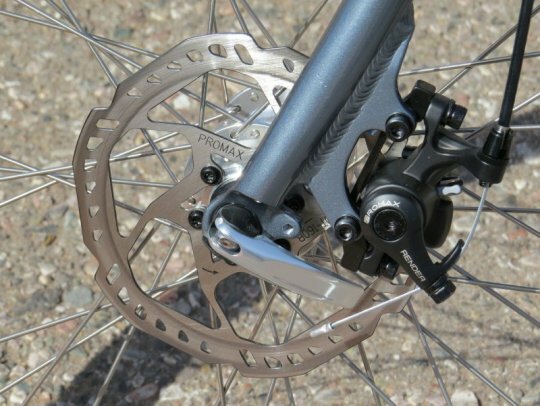 This is the front Promax Render mechanical disc brake with 160mm rotor. 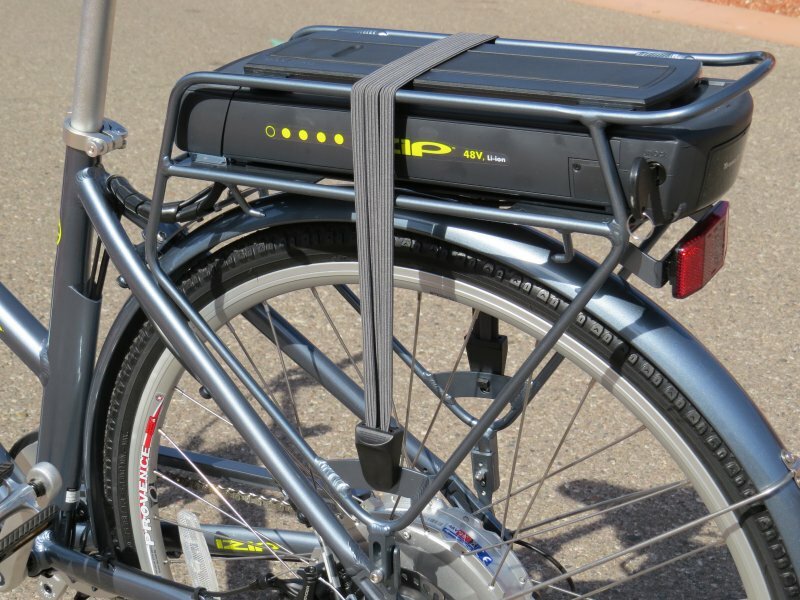 The 48V 8.8 ah (422 watt hour) lithium ion battery is housed in the rear rack. 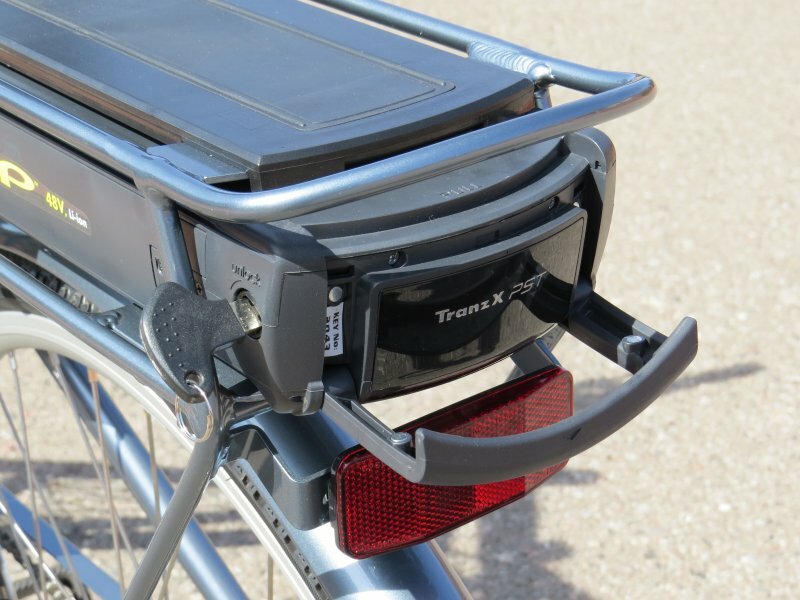 In addition, you can attach items to the top of the rack with the included bungie strap. The rear rack can also hold typical bike panniers/bags. The top of the rack features a grippy surface. 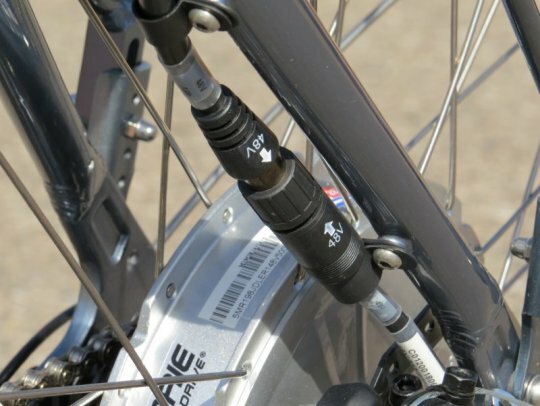 A key locks the battery in the rack on the left side of the bike. The Path+ comes with 2 keys. 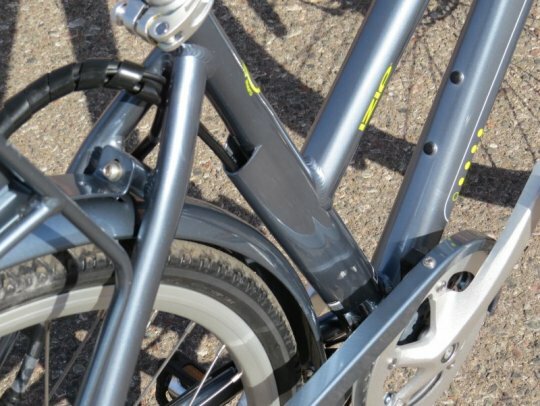 The charging port is on the right side of the bike. Charging the battery can be accomplished when the battery is on the bike or when it has been removed. Removing the battery from the bike is accomplished by unlocking the battery and pulling on the handle that folds down from the back of the battery. 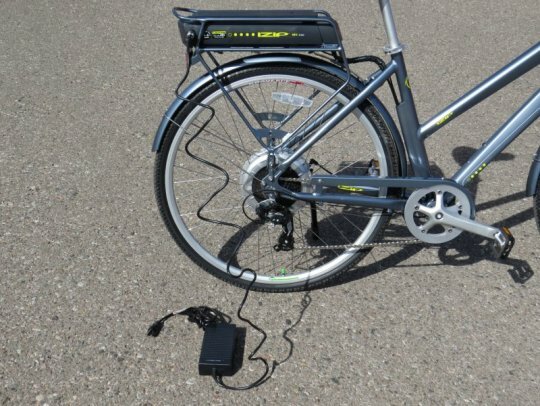 The ability to store and charge the battery separate from the bike is a nice feature. 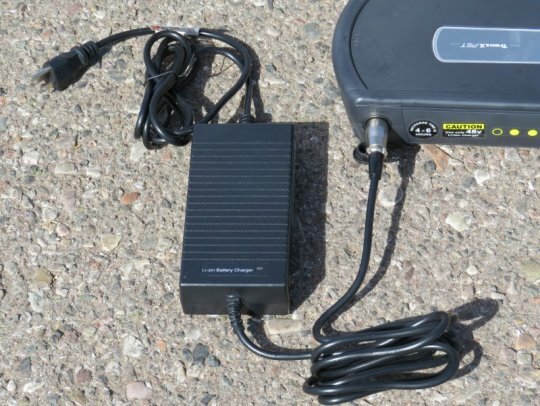 It takes 4-6 hours to completely charge the battery and the charger is about the size of a laptop computer charger. The Path+ saddle is a typical comfort style saddle. 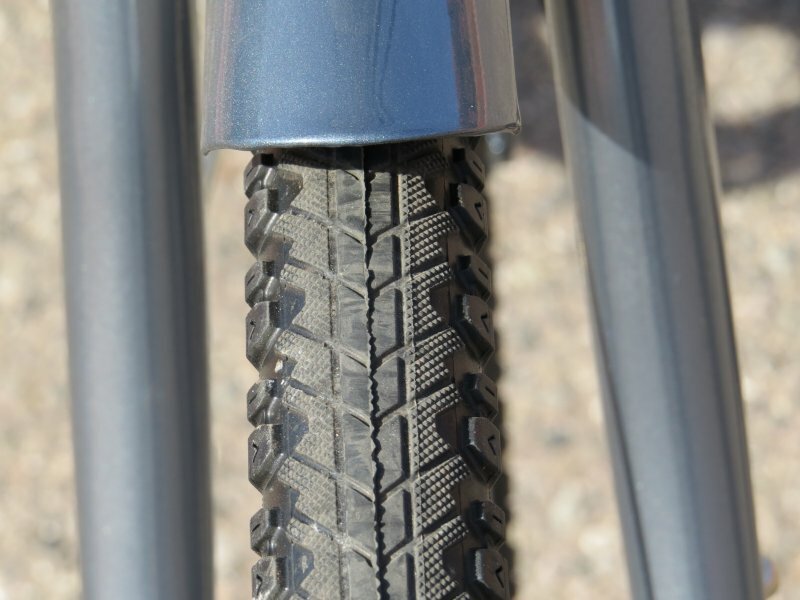 Here is a view of the CST center ridge 700x38c tires. 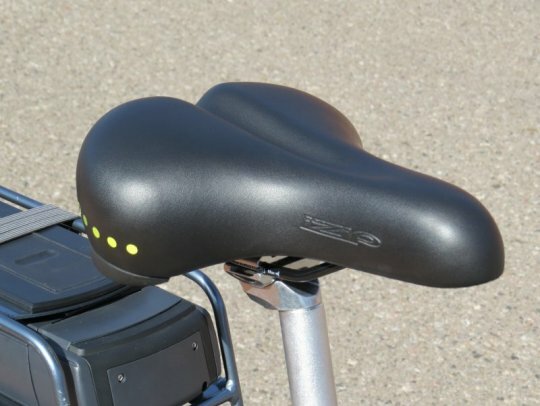 They have some side knobs for traction in the corners. Slime! 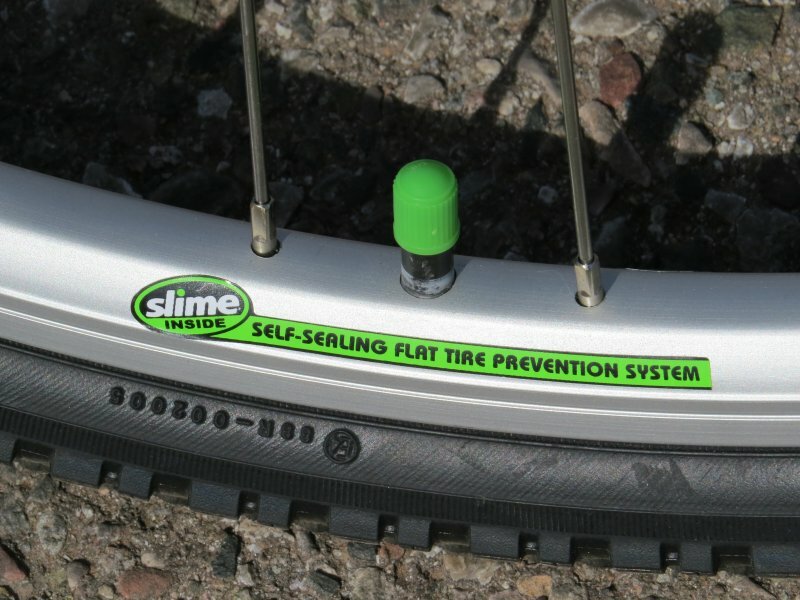 The Path+ comes with Slime tube sealant already installed. Slime does a good job of sealing small leaks caused by thorns, glass, nails, etc. It is nice to have this as a stock feature because it is no fun to get a flat tire! Assist Options: Pedal assist (cadence sensor) with levels 0-4 and/or throttle. 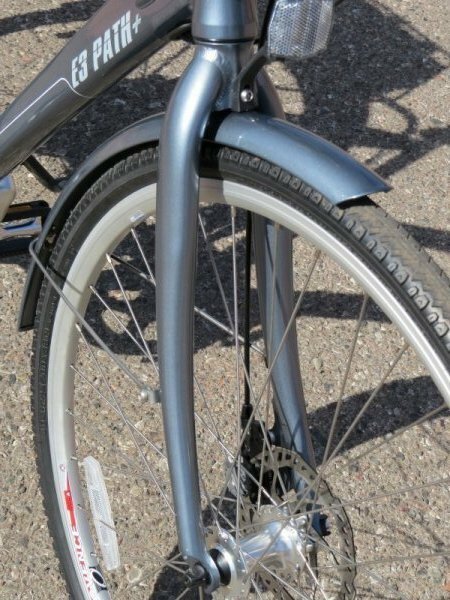 Accessories: Metal front and rear fenders, rear rack, bell, and kickstand. Colors: Grey (step through frame) and black (triangle frame). Price: $2,200 USD at the time of this review. Here is a link to the specifications page of the IZIP E3 Path+ electric bike. Noe, checkout part 2 of the IZIP E3 Path+ review with info on the ride characteristics, the range test, pros, cons, and overall thoughts! Wow. Thanks again Pete for the detailed pics and specs. I question whether the Path + shown in the pictures is the step through model. Hi Richard, this is the step thru model. Here is a link to the triangle frame model. Sounds like a terrific bike. What is the weight? The Path+ weighs 56 pounds. Once again, great job Pete, excellent picture quality, details. And beautiful work in Currie, bravo ! Hi Pete, Thanks for the pics and Part 1 review!! Looking forward to Part 2! 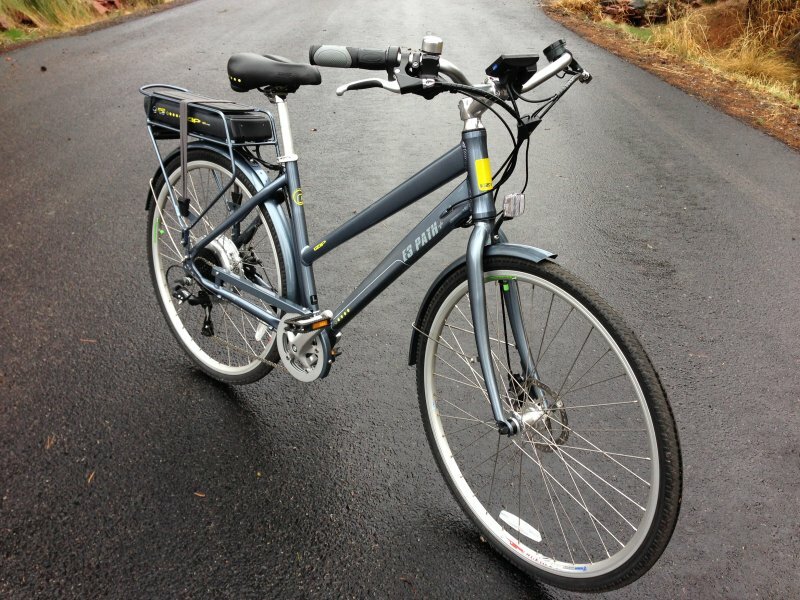 Have about a 1/2 mile hill near my neighborhood that I need to travel on, so looking forward to hear how this bike will respond! Any idea when the bike will be available? Any other questions, please don;t hesitate to contact me at [email protected]. Thanks for your interest in IZIP electric bicycles. The fact it comes pre-installed with Slime! 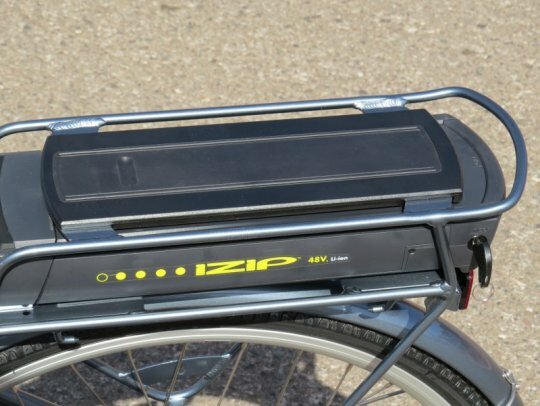 I am trying to decide between the new IZIP Zuma and Path Plus models. I have weighted the pros and cons of each and am indifferent as to the price difference. I am leaning more towards the Path Plus based on the cruise control. 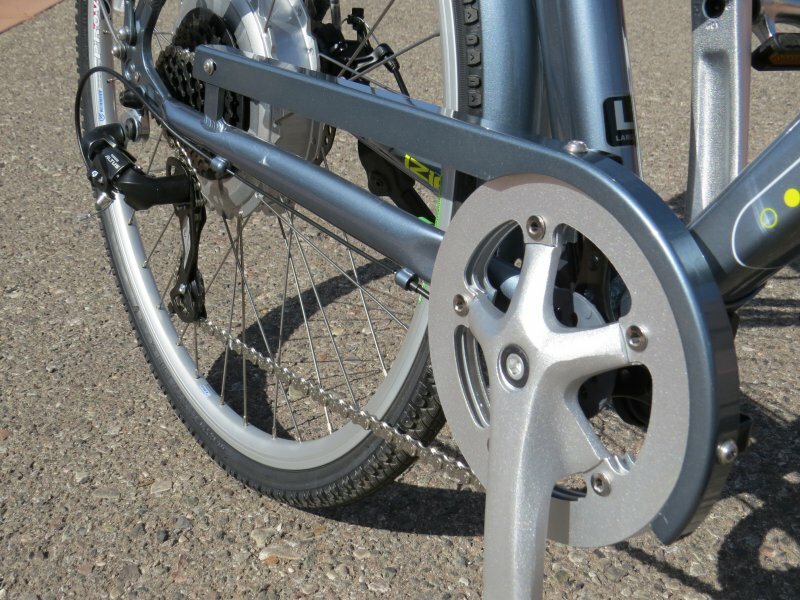 Could you shed some light on how the Path Plus 48V 500 watt gearless motor compares to the Zuma’s 36V 500 watt geared motor? I am 210 lbs and plan on using the throttle most of the time on regular pavement with no hills. Which one would be more powerful/appropriate? If you are nearby a dealer, I’d suggest that you test ride both bikes. Generally speaking, the geared hub motor on the Zuma may be a better choice based on the information you are providing. While both will easily handle the terrain and your weight, there is a bit more starting torque on the Zuma, especially if your planning on using throttle more then pedal assist, but I’ll bet you will be inclined to pedal much more then you expect once you feel the magic carpet ride! Hope that is helpful and don’t hesitate to let me know if you have other questions.